With over 30 years of experience we are a full service stone mason contractor. Unity Stone Quarry's highly skilled staff can professionally install walkways, patios, steps, fireplaces, and chimneys for any sized project. 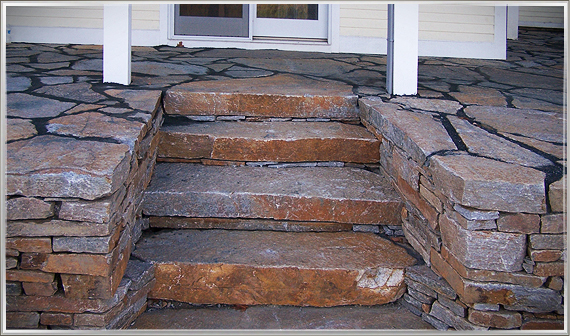 With an unlimited supply of stone Unity Stone Quarry can deliver, install, and maintain any project you can invision! Prices for our services vary according to project type, location, machinery needed, and project deadlines. We will do your job estimate free of charge as long as the location is within a reasonable driving distance. Along with craftsmenship and quality of work we will guide you through the stone selection process and come with the perfect design solution. Delivery for any amount of our stone is available. Please visit our delivery page for more details!